Hasbro’s 2012 Furby is ready and waiting to play with your child and your iPad. Touted as the Hot New Toy of the holiday season, it has a ton to offer! 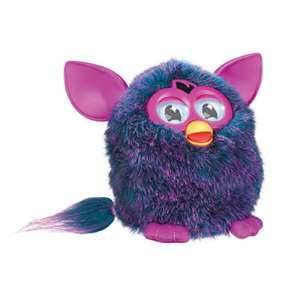 If you are a parent who is still in their 20’s, you probably remember owning the old school Furby with the mechanical eyelids and robotic voice. You also remember how popular they were and how insanely difficult it was to get your hands on one! The 2012 Furby, though streamlined, is no different in popularity and is projected to be this seasons hottest toy! The best part? He is iPad compatible! 2012 Furby still has the mechanical eyelids, however his eyes are now a digital display that let him display emotion through different facial expressions. He also has a tail that wasn’t there last time around and a few more touch-points to boot! Feeding Furby used to entail prying open his little beak with your finger and pressing his tongue, but no more! Furby is compatible with an App that is available for free in the iTunes App store. You have to use this App to believe it! Luckily, my 5 year old got one of these guys for her recent birthday and he’s eating a turkey sandwich prepared on my iPhone as we speak! That’s right, folks. A turkey sandwich. Once you have the interactive Furby App downloaded to your device, the possibilities are endless. The iPad (or iPhone) communicates with Furby via a sensor on his forehead. The App offers 4 different ways to interact with Furby: a Pantry, a Deli, a Translator and a Dictionary. Pantry- Furby’s pantry is loaded with food for him! There are good foods (i.e. grapefruit) and bad foods (i.e. dirty socks). If you feed him the good food, Furby thanks you! 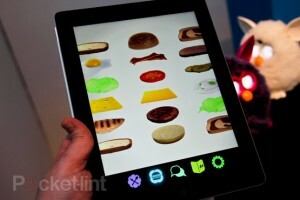 If you feed him the bad food, Furby spits it back out on to your iPad Screen (I know this from experience). Feeding is simple! Just place the device in front of Furby and use your finger to slide the food item off screen into Furby’s mouth. Deli- If the selection in the pantry is not enough for you, the Deli allows players to create their own food creations for Furby! Translator- When Furby comes out of his box, he speaks no English at all. This helpful translator listens to Furby and then displays what he says, on screen, in English. Dictionary- The dictionary allows the user to practice his or her Furbish (Furby’s language) so that they might talk to Furby in his native tongue! Furby is now available in stores and online for $54.00 and the Furby App is available for free via the iTunes App Store.